In OSDD, the larger complex problem would be broken into simpler, smaller set of activities which have a clear and well defined scope and deliverables. The smaller sets of activities are termed “work packets” or “work packages (WPs)”. This would enable to clearly specify the task to be carried out during the implementation of the project along with responsibilities for the respective WPs. The connections between the WPs describe the conceptual connections and the timings for their execution. Work Package 1 - Targets - all non toxic sites- starts with a whole range of computational activities including Systems Biology research. This package brings together the computational strengths and reinforces the concepts of open source movement by participation of academia, institutions and industries with strong inclination towards Open Source. It also includes setting up of facilities and networks, and the OSDD Portal. Work Package 2 - Expression of targets- deals with experimental expression of protein targets. Success of this work package is an important component and this work package brings in the true concept of sharing experimental reagents and chemicals in open source. Work Package 3 - Screen development- involves screening of targets discovered using large chemical libraries in order to identify the inhibitors with potential to become drugs. This package implementation may call for the participation of Contract Research Organizations as well. Some assays may be developed using smart innovative molecules. 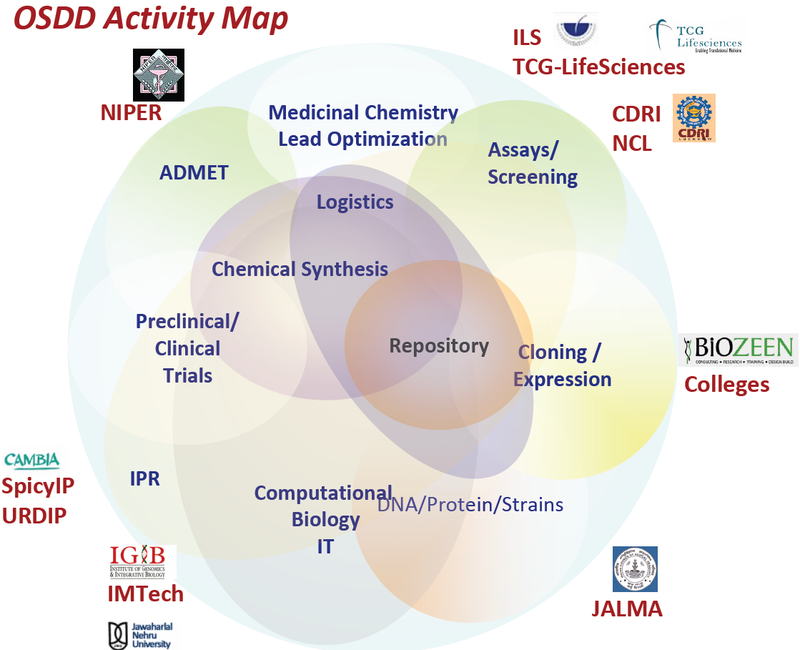 Work Package 4 - in silico docking and identification of a library of chemicals for specific screening -can be viewed as another very important computational aspect with its aim focusing on filtering or forestalling molecules with potential toxicity. Work Package 5 - Micro array gene expression for human cells and tissues with the best inhibitors- Modern genomics technologies of microarray would be used to build transcript profile and linked with Work Package 4 as an overlap to check the mechanisms of the best inhibitors on the host. Work Package 6 - Lead optimization on the non-toxic hits - which is an essential module of the drug discovery program. Work Package 7 - Medicinal chemistry - Synthesis of analogues which have nano-molecular binding to the target but do not alter the expression profile of host cell significantly compared to the native un-intervened state. Work Package 8 - Proteomics based lead affinity column to check for human cellular protein binding - to filter the potent lead with minimum binding. Work Package 10 - Clinical Development of New Molecular Entities - would look into the evaluation of new molecules so as to establish its safety, tolerability and efficacy and would be aimed at faster and more cost-effective development of the new drugs. All of these WPs taken together shall steer this endeavor firmly towards affordable drug development.